Citrulline is a classified nonessential amino acid that is, oddly, neither a component of any major proteins or enzymes. It provides for processes related to the production of energy in the body, and is responsible for the proper functioning of the immune system. Because of the nonessential nature of citrulline, it may not need to be consistently ingested from any dietary sources. Citrulline is a very unusual amino acid. 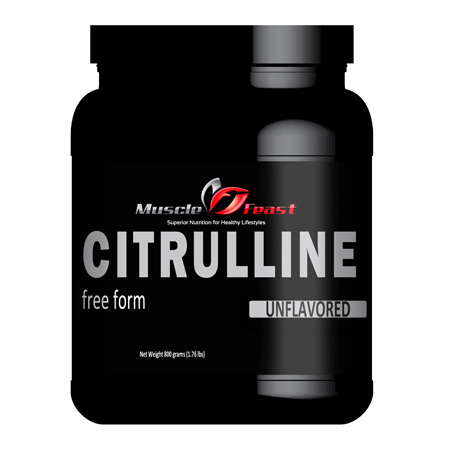 A variety of biological and chemical reactions define citrulline. This amino acid is formed in the urea cycle with the addition of carbon dioxide, forming ornithine. The process continues as ornithine is combined with aspartic acid to form arginosuccinic acid, which is then further metabolized to the most humanly bioavailable form, L-arginine. This critical transformation, of citrulline to arginine, is fundamental for maintaining the homeostasis of certain toxicities within the body. Arginine itself is a key component in the formation of urea in the liver. The process of removing nitrogen metabolites from the body are directly dependant upon citrulline’s conversion to arginine. Citrulline, aspartic acid, citric acid, and magnesium work synergistically to remove excessive nitrogen build-up, and aid in the digestion, absorption, and metabolic processes of specific proteins. Watermelon has the highest concentration of citrulline. The rind of the melon contains the most citrulline but it is found throughout. Different species of watermelon have varying amounts. Cucumbers, pumpkins, some melons and certain varieties of gourds also have smaller amounts of citrulline. Citrulline’s main function lies within its ability to provide for the detoxification process (es) of ammonia, and is, furthermore, essential for the excretion of oxidative waste processes in the human body via the urea cycle. It is also responsible for the treatment of Ornithine Transcarbamylase, a urea cycle disorder. Urea cycle disorder is genetic disorder characterized by a deficiency of one of the enzymes needed to sustain the urea cycle. Citrulline is also critical in the improvement of deficiencies associated with the immune system and its overall functioning. L-Citrulline is an amino acid that supports the body in optimizing blood flow through its conversion to L-arginine and then nitric oxide. Nitric oxide is involved in vasodilatation, and low levels are associated with mental and physical fatigue and sexual dysfunction. It helps the body to overcome fatigue and stress. The right amount of citrulline levels in the body promote increased energy and ensures normal functioning of the immune system. Citrulline supplements are a natural way to boost your body’s defense system. With deficiency in citrulline, fatigue becomes a common problem, thus preventing you to achieve optimal health and wellness. Citrulline is often recommended for patients suffering from urine problem. Frequent urination, can be treated using this compound. It is capable of minimizing almost every problem related to excessive urination. Citrulline is easy to use and can be prescribed for every age group. Scientific studies have shown, that citrulline can reverse the gradual advancement of atherosclerosis (congestion of arteries). This could mean that citrulline is beneficial to people suffering from cardiovascular diseases. Take up to 3 grams 2-3 times per day or as directed by your physician. Mix for 20-30 seconds using a shaker cup or mix thoroughly with a spoon. Mix into water or your favorite beverage 1-2 times daily or as directed by your physician. Mix for 20-30 seconds using a shaker cup or mix thoroughly with a spoon. May not mix very easily. May be hygroscopic and may clump during shipment. This does not affect the efficacy of the product; just the texture. Try mixing in sport drink or anything with a ph less than water to improve mixability. It may be necessary to let it sit for awhile. There are no known side effects reported or attributed to L-Citrulline. However, if you have liver or kidney disease, you should not take in high doses of amino acids without asking your doctor. It is crucial that you always speak to a knowledgeable healthcare provider before taking any dietary supplements. This advice is also recommended for anyone suffering from a health condition. Pregnant and nursing women should only take an amino acid after consulting your physician.